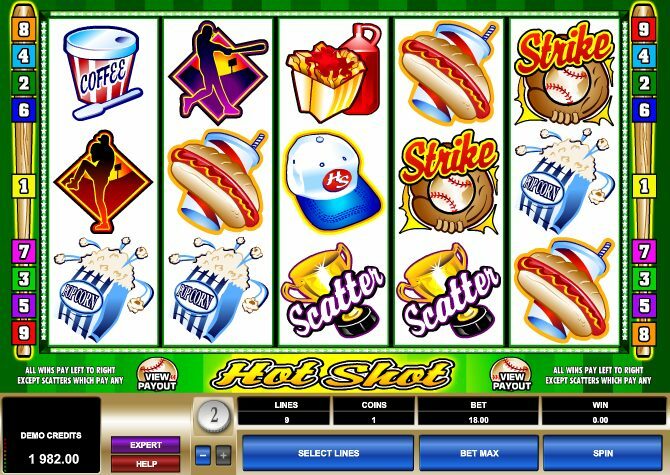 Not to be confused with Bally's hugely popular series of progressive jackpot slots like Hot Shot Progressive, Hot Shot Platinum, Hot Shots Part Deux* etc, Microgaming's addition to the pile marked, er, 'Hot Shot', is centered around the magic of baseball**. In feel, Hot Shot would make Rival Gaming’s slice of Americana, Doo-Wop Daddy-O, a great partner, and it at least does make you feel like you're in an American casino when playing it. Is this enough to make you want to continue playing the slot time and time again though? It does feel like this slot is missing something. That something is very key as well. The game lacks depth and excitement (despite the intense crowd noise) from the get go and it's disappointing. 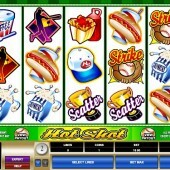 On the reels of this 5 reel, 9 pay-line slot are plenty of cartoony graphics straight out of the slots Americana playbook: baseballs, caps, popcorn, hot dogs, a carton of fries, sweets (candy), coffee, and various silhouettes of pitchers and batters in action. The Baseball on Fire is Wild! Look out for the baseball on fire icon, as it acts as the game’s Wild and substitutes for all other symbols other than the Scatter. However, this is no ordinary Wild – when it appears on the reels it will take on the form of other graphics adjacent to it in order to bridge gaps and make winning combos. It will substitute for any other graphic excluding the trophy Scatter. With bets starting out at $0.25 per spin you’ll be looking at some larger-than-average outlay to get some winnings back, but at least there are a cornucopia of special features and bonus rounds to make up for it. Or at least, I wish I was saying that. In fact, there’s a distinct lack of bonus features in this game, and even the cutesy graphics, atmospheric stadium crowd noises, or slick gameplay can’t really make up for the lack of bonuses. The replicating Wild is cute, but for base game junkies only. With only nine reels you may find yourself playing a lot in order to see any kind of return, but for sports atmosphere it's hard to beat. As for bonus hounds, check out RTG’s similar King of Swing slot, a baseball-themed game full of icons of the American institution. *Not really – Hot Shots Part Deux was a film starring Charlie Sheen. **If you live outside the USA, simply substitute 'magic' for 'utter tedium'.